Oil leakages frequently occur during oil product development and oil transportation. These incidents are a vital factor in water contamination, thus leading to serious environmental destruction. Therefore, superhydrophobic/superoleophilic material is one of the solutions to treat oily wastewater. This study aimed to develop a simple, fast and low-cost method to treat oily wastewater by synthesizing a new superhydrophobic/superoleophilic corn straw fiber via conventional impregnation. The corresponding results illustrate that abundant homogeneous silica (SiO2) granules evenly accreted on the surface of the prepared fiber were conducive to high surface roughness. Meanwhile, (Heptadecafluoro-1,1,2,2-tetradecyl) trimethoxysilane, a sort of silane coupling agent, could greatly reduce surface free energy by grafting with SiO2 particles on the corn straw fiber surface. The obtained superhydrophobic/superoleophilic corn straw fiber exhibited a water contact angle of 152° and an oil contact angle of 0° for various oils, strongly demonstrating its considerable application as an oil absorbent that can be applied for oil cleanup. In addition, the prepared fiber displayed a great chemical stability and environmental durability. Due to its high absorption capacity and absorption efficiency, the prepared fiber has great potential as a new oil absorbent for treatment of oily water. Oil-spill pollution can significantly destroy the human living environment and poses a severe threat to ecological systems (Cojocaru et al. 2011; Deng et al. 2013; Schaum et al. 2010). At present, physical methods (Angelova et al. 2011; Howarter and Youngblood 2007), chemical processing methods and biological treatment (Boopathy et al. 2012) to cleanup oil-bearing wastewater have been reported. Among them, physical adsorption techniques, which employ hydrophilic materials to remove waste oil from water, is considered as the most economic and valid method due to its high absorption capacity and low cost. However, most of the traditional oil absorbents generally encounter problems, such as low separation efficiency, high cost, poor absorption capacity and non-biodegradable characteristics (Karakasi and Moutsatsou 2010). Thus, fabrication of new environmental-friendly oil absorbing material with a higher absorption ability and lower production cost is required and urgent (Yao et al. 2011). Using waste biomass materials as an oil absorbent is of great interest for oil–water separation and is becoming an area of intense research because they are cheap, accessible, and biodegradable (Vlaev et al. 2011; Zang et al. 2016). Recently, superhydrophobic surfaces have attracted attention because of their unique properties, including self-cleaning, anti-sticking, water proof, chemical stability, and oil recovery (Yuan et al. 2013; Zang et al. 2015). In theory, construction of a hierarchical rough structure with low surface energy are two indispensable parameters for the formation of superhydrophobic surfaces, which are characterized by a water contact angle greater than 150° and a water sliding angle less than 10° (Kim et al. 2011; Li et al. 2010; Wang et al. 2011a). To date, multiple technologies and various materials have been proposed to achieve superhydrophobic and superoleophilic surfaces, such as the solution-immersion process, chemical etching, layer-by-layer assembly, laser treating, and ultrasound irradiation (Liang and Guo 2013; Zhang et al. 2013; Zhou et al. 2013). Corn straw fiber, a natural and biodegradable biomass from agricultural waste, is usually discarded and burned on the spot, thus resulting in severe air pollution. In fact, efficient utilization of straw resources is vital to solving the serious air pollution caused by straw burning. Zang et al. (2016) removed oil from water using superhydrophobic/superoleophilic corn straw fibers that they prepared with ZnO particles via conventional impregnation. ZnO particles are hollow spheres with an average diameter approximately 5 μm, and a hexadecyltrimethoxysilane (HDTMOS) chemical agent is employed to act as a hydrophobic modifier. In this study, we exploited corn straw fibers as a raw material to prepare a high-efficiency oil absorbent that exhibits great chemical stability and environmental friendliness. The superhydrophobic/superoleophilic properties of the prepared corn straw fiber arose from the combined effects from the deposition of homogeneous SiO2 inorganic particles, with an average particle size about 40–50 nm using the sol–gel method, and the hydrophobic embellishment of (Heptadecafluoro-1,1,2,2-tetradecyl) trimethoxysilane (PTES), thus giving the product the ability to efficiently dislodge oils from oily wastewater. Compared to HDTMOS, the amount of PTES is less; therefore, the production cost is reduced. In view of its intrinsic water-repellence, high absorption capacity, chemical stability and environmental friendliness, the prepared corn straw fiber floats on the surface of the water after absorbing the oil, allowing it to be easily transported and recycled. The information obtained in this study demonstrates that the prepared superhydrophobic/superoleophilic corn straw fiber can be widely applied in the treatment of oily wastewater, thereby providing new insight into producing a sustainable high-efficiency oil absorbent from agricultural waste. Corn straw from a farm in Harbin Jiangbei District was used in this study. Ethanol (99.7%), sodium hydroxide (96.0%), hydrogen peroxide (30.0%), hydrochloric acid (37%), ammonium hydroxide (25.0%), tetraethoxysilane (98.0%) and glacial acetic acid (99.5%) were purchased from Tianjin Kemiou Chemical Reagent Co., Ltd. (Tianjin, China). (Heptadecafluoro-1,1,2,2-tetradecyl) trimethoxysilane (99.5%), employed to decorate SiO2 granules, was purchased from Aladdin Chemicals Co., Ltd. (Shanghai, China). All chemicals were used as received without any purification. Diesel oil, gasoline, crude oil, bean oil, n-hexane, octane, toluene, and chloroform, supplied by Sigma-Aldrich Co., Ltd. (St. Louis, MO, USA), were used for oil contact angle testing and absorption capacity measurements. Peeled corn straw was placed in a pulveriser to obtain straw fibers, and then sieved through 60 and 80 mesh standard screens to collect fibers (250–425 μm). In addition, corn straw fibers were ultrasonically rinsed three times with deionized water, ethanol and deionized water. The corn straw was then placed in an aqueous solution of NaOH (100 mL, 0.5 wt%) and 30% H2O2 (3.5 mL) with stirring at ambient temperature for 14 h. This helped in removing the resins and additional impurities present in the corn straw and exposed the hydroxy groups. Next, the pH of above solution was adjusted to 6.5–7.0 with HCl (6 mol/L). After washing several times with deionized water to remove chemical residues, the pretreated corn straw was dried at 40 °C for 24 h until its weigh remained constant. The SiO2 particles were fabricated by a sol–gel process. Briefly, 10 mL NH3OH was added dropwise into a beaker containing 180 mL ethanol, 20 mL tetraethoxysilane and 20 mL deionized water. The solution was vigorously stirred for 2 h at room temperature. Next, the mixture was left for 10 h to produce a white suspension. Homogeneous SiO2 particles were dissociated from the white suspension by centrifugation in ethanol and then dried at 60 °C for 6 h.
In detail, 0.1 g SiO2 was added to a solution of 10 mL anhydrous ethanol, 0.03 mL PTES, 0.025 mL H2O, and 0.005 mL acetic acid. Subsequently, 0.2 g corn straw was added into the mixture. The reaction was maintained under stirring at room temperature for 5 h, and then placed in an oven at 65 °C for 3 h. Finally, the superhydrophobic/superoleophilic corn straw fibers were acquired by drying the corn straw at 50 °C until its weight was consistent. In this study, the PTES chemical agent acted as a hydrophobic modifier, with its modification mechanism as follows (Fig. 1): silicon hydroxyl groups, which were generated from a hydrolysis reaction with the PTES reagent, reacted with hydroxyl groups on the surfaces of SiO2 particles and pristine corn straw fibers. Therefore, the hydrophobic heptadecafluoro-decylalkyl of PTES was introduced onto the surface of the fibers to induce the low surface energy of superhydrophobic/superoleophilic corn straw. Scanning electron microscope (SEM) images were collected on a Hitachi TM3030 tabletop microscope. The chemical composition of the prepared corn straw product was detected by Fourier transform infrared spectroscopy (FTIR, Magna-IR 560, Nicolet, USA), X-ray photoelectron spectroscopy (XPS, PHI Thermo Fisher Scientific, USA) and energy-dispersive X-ray analysis (EDX, Quantax70, USA). Water contact angle (WCA) and oil contact angle (OCA) measurements were carried out on a contact angle instrument (CA-A, Hitachi, Japan) by dropping a 5 μL deionized water or oil onto five or more different positions on the corn straw specimens. The values of the WCA and OCA were determined as averages of those of five measurements. where q is the absorption capability (g/g); m2 is the weight of corn straw fibers after the absorption; and m1 is the initial weight of corn straw fibers prior to absorption. where k is the oil removal efficiency (%); w3 is the weight of the corn straw fibers after absorption; w2 is the initial weight of the corn straw fibers prior to absorption; and w1 is the weight of water absorbed in the absorbents. In this study, one-way analysis of variance (AVONA) was used to analyze the reliability of the experimental data. All experimental data are presented as averages of five measurements. A p value ≥ 0.95 for the Student’s t test demonstrates reliability of the experimental data. It is known that surface microtopography is primarily responsible for establishing superhydrophobic surface, similar to the lotus leaf’s self-cleaning property that is associated with its micro/nanostructure (Wang et al. 2015; Autumn et al. 2000; Ju et al. 2012; Wei et al. 2010; Gao et al. 2009; Zhang et al. 2008). Therefore, it is crucial to survey the surface micro-profiles of corn straw fiber by SEM. The corresponding surface morphology results of raw corn straw fiber and superhydrophobic/superoleophilic corn straw fiber are shown in Fig. 2. At low SEM magnifications (Fig. 2a, b), there was no marked difference in the fibrous shape between untreated sample and modified product, indicating that the product retained the characteristics of the original corn straw fiber. In contrast with the smooth fiber surface of pristine corn straw, the high magnification SEM image of the prepared superhydrophobic/superoleophilic corn straw fiber showed a surface layer of solid spherical granules, with an average diameter of 40–50 nm (Fig. 2c), which was attributed to the compact deposition of the SiO2 particles. where γsv, γsl and γlv are the interfacial free energy of solid/vapor, solid/liquid, and liquid/vapor, respectively; and θ is the contact angle. In general, the value of the contact angle is an essential to measuring the surface wettability of a superhydrophobic material. Hence, the water/oil contact angles of corn straw fiber were investigated to determine its superhydrophobic/superoleophilic characteristics. For raw corn straw fiber, a water contact angle of 0° was visible on fiber surface, which is ascribed to massive hydroxyl groups on a pristine fiber surface (Fig. 3a). 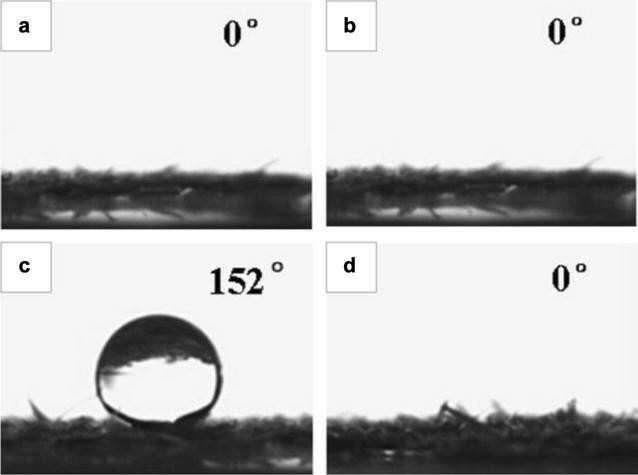 In contrast, a spherical water droplet was observed on the prepared fiber, with a water contact angle of 152° (Fig. 3c), indicating its superior superhydrophobicity. Moreover, when dripped on the surface of the raw corn straw fiber and prepared corn straw fiber, oil droplets instantly spread, indicating an oil contact angle of 0° (Fig. 3b, d). Uniform coverage of sub-micrometer SiO2 microspheres, coupled with micron-sized corn straw fiber, while using the PTES function as a modifier to ornament SiO2 particles would facilitate low surface energy. The combination of a particularly hierarchical rough structure and low surface energy is regarded as an indispensable condition when constructing special superhydrophobic and superoleophilic material from the resulting corn straw fiber surface. Because air was captured and trapped, while falling onto corn straw fiber surface, by the abundant cavities and interspaces among SiO2 particles on the fiber surface, a water droplet could contact the trapped air to manifest a non-wetting phenomenon. As soon as water was dropped on the prepared corn straw fiber surface, it was repelled without leaving a trail, which demonstrates the great waterproof characteristic of the resulting product (Wang et al. 2011b). Accordingly, it could be deduced that the wettability of the corn straw fiber was transformed from superhydrophilicity to superhydrophobicity. Taken together, these results demonstrate the superhydrophobic and superoleophilic properties of the prepared corn straw fiber. In this study, the combination of numerous SiO2 particle aggregates and surface modification by PTES could prevent water from wetting the treated fiber surface and result in water droplets on the obtained corn straw fiber surface rolling off without leaving a trace, thereby demonstrating a novel non-wetting material. Hence, the prepared superhydrophobic/superoleophilic corn straw fiber absorbs only oil while completely repelling water. Large amounts of hydroxyl groups on the surface of the silica particles are critical for the preparation of superhydrophobic/superoleophilic corn straw fibers (Wang et al. 2011b). In addition, due to the great influence of silica size distribution on the generation of a superhydrophobic surface, we strictly abided to the well-known Stöber method for fabrication of silica particles. FTIR, XPS and EDX were used to analyze the surface chemical composition of superhydrophobic/superoleophilic corn straw fiber. The relevant FTIR spectra of SiO2 particles, pristine corn straw fiber and superhydrophobic/superoleophilic corn straw fiber are listed in Fig. 4. The absorption peak at 955 cm−1 was ascribed to stretching vibration of isolated Si–OH, which was perceptible only in the case of bare silica (Fig. 4a) (Kulkarni et al. 2008). Moreover, corresponding to Si–O–Si asymmetric stretching and symmetric stretching, the bands at 1056 and 795 cm−1 were also observable (Hsieh et al. 2010; Vinogradova et al. 2006). Compared with pristine corn straw fiber, the band at 804 cm−1 was due to Si–O–Si symmetric stretching (Hsieh et al. 2010) and the absorption peak at 1203 cm−1 was a typical characteristic of the C–F stretching vibration of PTES (Zhou et al. 2013), which proves that the SiO2 particle deposition and PTES organic chemistry reagent were observed on the prepared superhydrophobic/superoleophilic corn straw fiber surface (Fig. 4b). The XPS spectra of pristine corn straw fiber and superhydrophobic/superoleophilic corn straw fiber are shown in Fig. 5. With regards to raw corn straw fiber (Fig. 5a), only peaks corresponding to C1s and O1s elements were observed. By contrast, the XPS spectra of superhydrophobic/superoleophilic corn straw fiber demonstrated four new peaks including Si2p, Si2s, F1s and F KLL, which accounted for the generation of SiO2 particles and PTES on the prepared fiber surface. However, the peak intensity of C1s and O1s in curve b was weaker than that in curve a. This can be attributed to the addition of SiO2 particles and PTES, thereby decreasing the relative mass ratio of C1s and O1s. Apart from FTIR and XPS characterizations, the elemental composition of superhydrophobic/superoleophilic corn straw fiber was investigated via energy-dispersive X-ray analysis (EDX). The oxygen (O) peak and the carbon (C) peak were observed in corn straw fiber (Fig. 6). In comparison with the raw fiber, there were two new peaks of silica (Si) and fluorine (F) induced by SiO2 and PTES in the prepared superhydrophobic/superoleophilic corn straw fiber, thus providing evidence for the presence of SiO2 particles and PTES on the obtained corn straw fiber surface. Taken together, these results show that SiO2 particles were successfully modified by PTES and truly existed on the surface of the superhydrophobic/superoleophilic corn straw fiber. Considering the importance of environment durability and chemical stability for prepared materials used in practical application, it is necessary to investigate these properties with respect to superhydrophobic/superoleophilic corn straw fiber to confirm its potential as an oil absorbent. The effects of acidic and alkaline conditions on the wettability of superhydrophobic/superoleophilic corn straw fiber were systematically investigated. Contact angle measurements were performed by pipetting 5 μL aqueous solution, from pH 0–14, onto fiber surfaces in order to evaluate chemical stability and durability of the prepared material (Fig. 7a). The measured water contact angle ranged from 152° to 150°, while the oil contact angle remained constant at 0°, implying that the resulting fiber surface still maintained outstanding superhydrophobicity and superoleophilicity properties, even in strong acid and strong alkaline conditions. To evaluate its environmental stability, the contact angles of water and oil of the superhydrophobic/superoleophilic corn straw fiber were monitored over time at ambient temperature and humidity (Fig. 7b). After 150 days, there were no distinct changes in the water and oil contact angles of the prepared corn straw fiber, which clearly demonstrates that the superhydrophobic/superoleophilic corn straw fiber obtained in this study possess excellent environment stability. Because the prepared corn straw exhibited favorable superhydrophobic/superoleophilic performance in both acidic solutions and under ambient conditions, these prepared fibers could be utilized as highly selective absorption materials to achieve effective separation of oil–water mixtures. Oil absorption performance is measured by the absorption capacity (g/g), as well as the oil removal efficiency (%). To determine the maximum absorption capacity of superhydrophobic/superoleophilic corn straw fiber, experiments were performed in a variety of pure oils and organic solvents. Figure 8a presents the absorption capacities of raw corn straw fiber, pretreated corn straw fiber and the prepared superhydrophobic/superoleophilic corn straw fiber in various oils and organic solvents. The adsorption capacity of raw corn straw fiber was very low and was always less than 10 g/g. In contrast with the raw fiber, the pretreated corn straw fiber exhibited a higher absorption capacity for all oils and organic solvents, with its value almost 3 times higher than pristine corn straw fiber. Moreover, the oil absorption quantity of the prepared superhydrophobic/superoleophilic corn straw fiber for diesel oil, crude oil, bean oil, and chloroform was relatively large at 17.5, 20.3, 22.6, and 27.8 times their own quality, respectively; however, the oil absorption quantity of the prepared superhydrophobic/superoleophilic corn straw fiber for gasoline, n-hexane, octane, and toluene was relatively small at 15.5, 13.5, 15.1, and 16.3 times their own quality, respectively. The reason is that the oil absorption capacity is relevant to the viscosity and density of the oil products and organic solvents, with a higher viscosity and density resulting in a saturated absorption capacity of prepared corn straw fiber (Guo et al. 2015). For the same oil or organic solvents, the absorption capacity of the prepared superhydrophobic/superoleophilic corn straw fiber was slightly higher than that of the pretreated corn straw fiber, indicating that the superhydrophobic modification can further enhance the oil capacity, which is beneficial for practical application. In addition to the absorption capacity, the absorption efficiency of the prepared corn straw fiber was studied to ascertain the potential of superhydrophobic/superoleophilic corn straw fiber in oil/water separation. In theory, the superhydrophobic/superoleophilic corn straw fibers absorb very little water; however, there are errors in the oil absorption efficiency. When the water content of the oil–water mixture increased, the prepared corn straw fiber absorbed a small amount of water during magnetic stirring. The oil removal efficiency of the resulting fiber for diesel oil and crude oil varied from 100 to 99%, with different mass ratios of water-to-oil (Fig. 8b). The main cause of this phenomenon is that there was a small amount of water absorbed at the same time that the prepared corn straw fibers absorb oil (Wang et al. 2013), which indicates that the prepared fiber can be widely applied for oil removal from water. Taken together, because of the high absorption capacity and oil removal efficiency, we clearly demonstrate that the novel superhydrophobic/superoleophilic corn straw fiber obtained in this study can be regarded as a high-efficient oil absorbent with great chemical stability and environmental durability. Moreover, it has a higher oil adsorption capacity, compared to other biomass-based absorbents (Table 1). In this study, we successfully developed a preparation process for a novel superhydrophobic/superoleophilic corn straw fiber by attachment of PTES-modified SiO2 particles onto the fiber surface via the sol–gel and impregnation method. 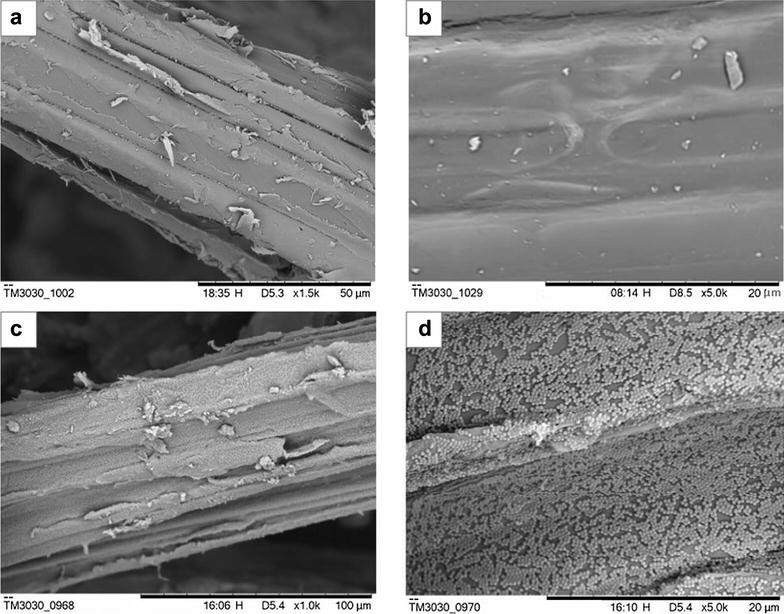 The prepared corn straw fiber exhibited outstanding properties of superhydrophobicity and simultaneous superoleophilicity with a water contact angle of 152° and an oil contact angle of 0° for different oils. In addition, the microtopography, wetting property, chemical composition and oil absorption performance were comprehensively studied. Results revealed that SiO2 granules successfully modified by PTES were robustly attached to the fiber surface, resulting in a hierarchical structure and low surface energy, thus giving rise to the significant phenomenon of both superhydrophobicity and superoleophilicity. Moreover, the prepared superhydrophobic/superoleophilic corn straw fiber displayed great chemical stability and environmental durability. Most importantly, the prepared superhydrophobic/superoleophilic corn straw fiber possessed an excellent absorption capacity and high absorption efficiency. Taken together, these results demonstrate that the prepared fiber obtained in this study exhibits a high application potential to effectively separate oil/water mixtures. PTES: (Heptadecafluoro-1,1,2,2-tetradecyl) trimethoxysilane; FTIR: Fourier transformation infrared spectroscope; XPS: X-ray photoelectron spectroscopy; EDX: energy-dispersive X-ray analysis; WCA: water contact angle; OCA: oil contact angle; SEM: scanning electron microscope. γ sv , γ sl and γ lv : solid–vapor, solid–liquid and liquid–vapor interfacial tensions, respectively; θ: contact angle; q: sorption capability (g/g); m2: the weight of corn straw fibers after absorption; m1: the initial weight of corn straw fibers before absorption; k: oil removal efficiency (%); w3: the weight of corn straw fibers after absorption; w2: the initial weight of corn straw fibers before absorption; w1: the weight of water absorbed in the absorbents. YX and HY designed the study, performed experiments, analyzed data, and prepared the manuscript. DZ, FL and XH contributed to the discussion. CY, SHH, JSC and YZ reviewed the results, helped in data analysis, and edited the manuscript. All authors read and approved the final manuscript. The authors would like to acknowledge English-editing support by Paul Steed at NCKU language center. This research was supported by the Fundamental Research Funds for the Central Universities (2572015EB01) and the National Natural Science Foundation of China (31470584).